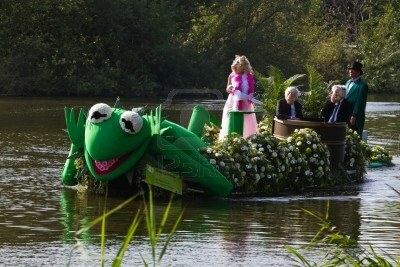 Parades have not been strictly on land, there have been numerous parades on water. Floats have been really that: large objects floating on water. Several operas have been performed on the water, with lots of gigantic moving props. Large attraction companies like Disney have combined pageant wagons and waterfloats in some of their watershows like Mythica in their Tokyo Disney Sea park. And now there are already water arenas where you can even watch sportsgames on floating fields while the tribunes for the audiences are on land. Stagefloats are the next generation of waterfloats. They are large platforms that can move around freely on the water. They have a large below waterlevel segment with movable platforms that can rise objects and scenery above the water level. This segment can be filled with water, or with heavy smoke, or with nothing because when not lit no one will even notice it in the dark of night. They are like moving stages with a large downstage area from which everything can ascend and descend. Lighting can easily be attached to the float, just like all pyrotechnics and fountains. It gives totall freedom of what happens on the water, just like on a real stage. But these floats can move around freely, so that a scene begin on stage right and end stage left. The actors can walk from one float to another…. The options are endless. With stagefloats you don’t need any fixed waterstages, or stages that move around mechanically. No difficulties with lighting and special effects. This is the perfect solution for any watershow! This entry was posted in Stagefloats and tagged asia, Augmented Reality, Creativity, Disney, Entertainment., Fire, FUTURE, Hologram, Holograms, illusions, Magic, magician, marketing, Pyro, Special Effects, Stage Magic, stagefloat, stagefloats, Theatre, Theatrical Effects, Universal Studios. Bookmark the permalink.